TecniGlas is one of the world's largest suppliers of high temperature glass to fireplace and woodstove manufacturers. We have sold over 10 million square feet of transparent glass-ceramics. Generally, we supply high temperature glass to manufacturers as original equipment parts. As a service to some of our fireplace and woodstove manufacturers, we also offer replacement glass parts to dealers and consumers. If you are a dealer or consumer looking to replace a broken glass for your fireplace or woodstove, this page is for you. Q: What Kind Of Glass Do I Need? Most North American fireplaces and wood stoves have either tempered glass or high temperature glass-ceramic. Tempered glass is most often found on low temperature and economy fireplaces, while glass-ceramic is found on higher end fireplaces and most wood stoves. The difference between them is that tempered glass is less expensive, but it's not suitable for many applications. The problem with tempered glass is that it cannot survive high heat. It will break when heated above a few hundred degrees. Also, tempered will shatter if its suddenly cooled (spill a drink on it, or drop some snow on it while loading your stove). Another shortcoming of tempered is that at modest temperatures the glass will 'lose its temper' over time meaning that its safety aspects will decline as you use your fireplace. Glass-ceramics, on the other hand, are made especially for high heat applications like fireplaces and wood stoves. Its the same type of material that is used on stoves and glass cooktops. It can take the heat (up to 1400F) and will not break if the temperature changes rapidly. You can tell what kind of glass you had in your fireplace or wood stove by looking at the broken pieces of your previous glass. 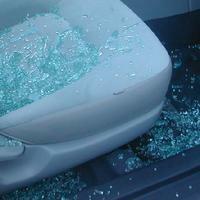 Tempered glass breaks into uniform sized little pebbles about 1/2" long (like a broken car window). 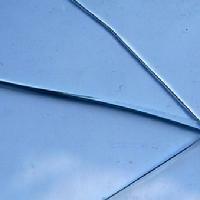 Glass-ceramics break like regular annealed glass in longer random sized shards (like a broken house window). Most of the time, glass-ceramic is what you need. It is meant for this application and it can be cut to your exact size quickly. Most of the fireplace and wood stove replacement glass we supply is glass-ceramic. We offer SCHOTT ROBAX glass-ceramic. Its by far the worldwide market leader in glass-ceramics for heating appliances. It has the quality and durability you'd expect from the market leading product. It's exactly what the manufacturers use. You cannot go wrong using it. For these reasons, we no longer offer tempered glass will quote you SCHOTT ROBAX glass-ceramic. 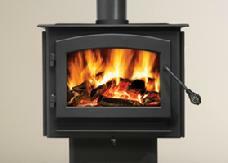 For special applications like EPA certified low emission wood stoves you can request a special version of the glass called ROBAX IR, which has an additional special optical coating on it that reflects infra-red heat back into the firebox to help the stove burn hotter and help combust the fuel more completely and cleanly. Q: Do I Need A New Gasket? Most glass is mounted with clips or tabs that hold the glass in place. 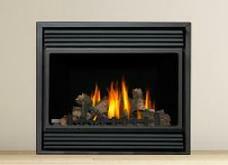 Usually there is a gasket between the glass and the metal frame of the fireplace or wood stove door. This gasket is important and must be functional and installed correctly. It often is a fiberglass rope or tape that serves to seal the air gap between the glass and the metal frame. The gasket provides an airtight seal, important to keep the smoke out of the room, yet it is slightly flexible enough to allow the glass and metal frame to thermally expand or contract at slightly different rates when heated while maintaining a tight air seal. OEM gaskets come in many shapes - we can supply you with a standard gasket rope which often can do the job - or you can check with your local fireplace dealer for a specific replacement gasket. Replacement glass is only available in flat glass. Curved or bent glass is not available for replacement. Measure the existing glass or opening with enough clearance for the gasket. You don't want the glass to fit too tightly as it can be cracked by the frame if its too tight. If the glass is rectangular, measure the width and the height. If the glass is curved or shaped send us the measurements or a tracing as best you can. For complicated shapes some people will cut a piece of cardboard to fit the opening, then measure or send us that. Q: How Will My Replacement Fireplace Glass Be Shipped? We use shipping boxes designed specially for our fireplace and wood stove replacement glass and ship the package using traditional couriers and parcel services. We ship this kind of glass every day to across the US and Canada. We guarantee that your glass will be delivered to you in good order. Note: the vast majority of our shipments arrive in pristine shape, but sometimes the courier has a bad day. If the shipping package appears damaged or broken when its delivered to you, just refuse to accept the package from the courier and let us know right away! Do not accept or open a damaged package. This automatically sets up the insurance claim process which we will handle and we will send you a new piece right away. We are not responsible, however, if you order the wrong size or damage the glass during installation. 1. Measure the size you need (width and height in inches) either from the piece you are replacing or the opening in the frame. Please measure carefully as your piece will be custom made to the size you order. 2. Enter this information, along with your contact information in the form below. We will respond with a price quote for ROBAX glass-ceramic, including shipping to your door. Then, if you want to buy, we can process your order with credit card payment. We can fabricate and ship your custom piece of glass most orders in 3-5 business days. Ground shipping to most of the US and Canada takes a few more days. RUSH orders are possible for extra charge. Please keep in mind that we can be very busy during fireplace season and so please enquire at time of your order what our current lead time is. To place an order or obtain a quote, please complete the form below.